An Angel Food Cake, or Angel Cake, has a sweet golden brown crust with a soft and spongy snowy white interior. This cake is made with egg whites, sugar, vanilla and almond extracts, and flour. It does not contain egg yolks or any fat so it is perfect for those watching their fat intake. It can be eaten plain with just a dusting of powdered (confectioners of icing) sugar, filled and frosted with your favorite icing, or served with fresh fruit and softly whipped cream. It is also excellent with fruit sauces (raspberry and strawberry are nice), chocolate sauce, lemon curd, ice cream, frozen yogurt, sherbet or sorbet. So what do we need to know to make a great Angel Food Cake? First, an Angel Food Cake gets its rise, not from baking powder or baking soda, but solely from the air whipped into egg whites. In order to get the maximum volume from the egg whites, make sure your mixing bowl and beater are clean, dry, and free of grease and have the egg whites at room temperature. The recipe begins with beating the whites until foamy. Then cream of tartar is added which helps to stabilize the whites. Once the whites form soft peaks, the sugar is gradually beaten in, one tablespoon at a time. (Adding the sugar gradually ensures that it fully dissolves into the egg whites.) Continue to beat the egg whites until stiff glossy peaks form. (You have probably noticed that Angel Food Cakes do use more sugar than other types of sponge cakes and this is to support and stabilize the large amount of egg whites.) At this point cake flour, mixed with a little sugar to prevent the flour from clumping, is folded into the beaten egg whites. (Cake flour is a low gluten flour, and is used to give the cake its delicate texture.) The flour is gradually folded in to ensure that the batter does not deflate. Quick light strokes with a rubber spatula or large balloon whisk are all that is needed. The batter is then poured into an ungreased tube pan with a removable bottom which gives the cake support as well as making it easier to remove the baked cake. The pan is left ungreased so the batter will cling to the sides of the pan as it bakes and allows the cake to reach its full volume. The hole in the middle of the pan allows the hot air to circulate and reach the center of the cake. Unlike most cakes that are simply placed on a wire rack to cool, angel food cakes are immediately inverted so the baked cake will maintain its volume and to keep it from shrinking as it cools. 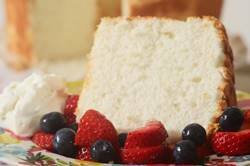 Angel Food Cake is at its best the day it is made, although it can be stored for a few days. So what do we do with all the leftover yolks? Well, you could freeze them for later use. Sharon Tyler Herbst in "The Food Lover's Tiptionary" advises "adding 1/8 teaspoon salt or 1 1/2 teaspoons sugar to each 1/4 cup of yolks (4 yolks) and beat to combine. This inhibits gelatin and whether you add salt or sugar depends on how you will be using the yolks later on." Egg yolks can be frozen for up to three months or else placed in the refrigerator for a few days. Or you could make ice cream as this is a great way to use leftover egg yolks. Other ideas are Creme Anglaise (Custard Sauce), Pastry Cream, or maybe a Yellow Butter Cake. Angel Food Cake: Preheat oven to 350 degrees F (177 degrees C) and place rack in center of oven. Have ready a 10 inch (25 cm) two piece angel food cake (tube) pan. In a large bowl sift together 3/4 cup (150 grams) granulated white sugar and the sifted cake flour. In your electric mixer, with the whisk attachment, beat the egg whites until foamy. Add the cream of tartar, lemon juice, and salt and continue to beat until soft peaks form. Gradually beat in the remaining 3/4 cup (150 grams) granulated white sugar, a tablespoon at a time, until glossy stiff peaks form. Scrape down the sides of the bowl as needed. Beat in the vanilla extract and almond extract. Pour the batter into the pan and run a metal spatula or knife through the batter to get rid of any air pockets. Smooth the top and bake in the preheated oven for about 40 - 45 minutes. The cake is done when a wooden skewer inserted in the center of the cake comes out clean and the cake springs back when gently pressed. The top of the cake will have cracks. Do not over bake. Immediately upon removing from the oven invert the pan. Suspend the pan by placing the inner tube on the top of a wine bottle or flat topped glass. Allow the cake to cool for about 1 1/2 hours. When completely cool, run a metal spatula or knife around the sides of the pan to loosen the cake and then remove the cake from the pan. Next, run a metal spatula or knife along the bottom and center core of the pan and remove. Place on your serving plate. It is best to cut this cake with a serrated knife using a back-and-forth sawing motion. Try not to press down on the cake when cutting as this will squash its soft and spongy texture. This cake is best served on the day it is made but it will keep covered for a few days at room temperature or for several days in the refrigerator. It is great toasted. This cake can be eaten alone with just a dusting of confectioners' (powdered or icing) sugar. Is also wonderful with fresh berries and softly whipped cream. Another idea is to serve with ice cream, strawberry or raspberry puree, or chocolate sauce. Note: Cream of Tartar is tartaric acid and is a fine white crystalline acid salt which is a by-product of the wine-making industry. It is used when whipping egg whites to stabilize them and to prevent over beating and the whites drying out.